TheArmenianKitchen.com : Happy Birthday America! The Fourth of July certainly isn't an Armenian holiday -- but there were Armenians in America even before the Revolution. In fact, the first Armenians to arrive were among the first Europeans to settle in the New World, according to Prof. Dennis Papazian, founding director of the Armenian Research Center at the University of Michigan. 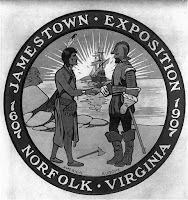 Papazian writes that one "Martin ye Armenian" turned up in Jamestown -- the first permanent English settlement in The Colonies -- by 1619. Two more Armenians (one of them named George) arrived there in 1655 at the invitation of the governor of Virginia. Both were experts in silkworm breeding. Papazian notes that the efforts to raise silkworms apparently fizzled, but George received 4,000 pounds of tobacco in return for his efforts. We have no further information on these Armenian-American pioneers. Strictly conjecture: Could they have been Robyn's relatives? After all, her maternal grandfather was a silk weaver from Musa Dagh. Robyn and I haven't been to Jamestown, but we did visit Virginia's Colonial Williamsburg some years ago. I remember being struck by the presence of a backgammon set in one tableau.